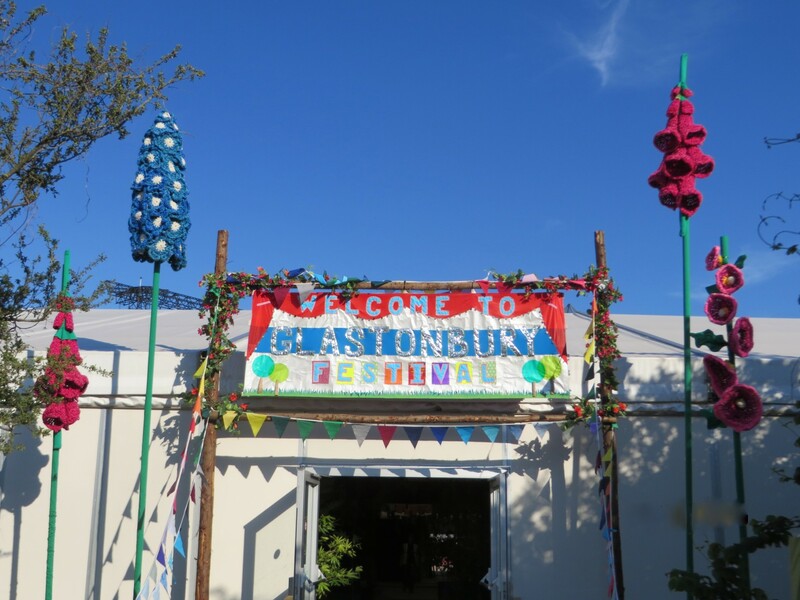 You are here: Home > Making a woodland at the pyramid stage! 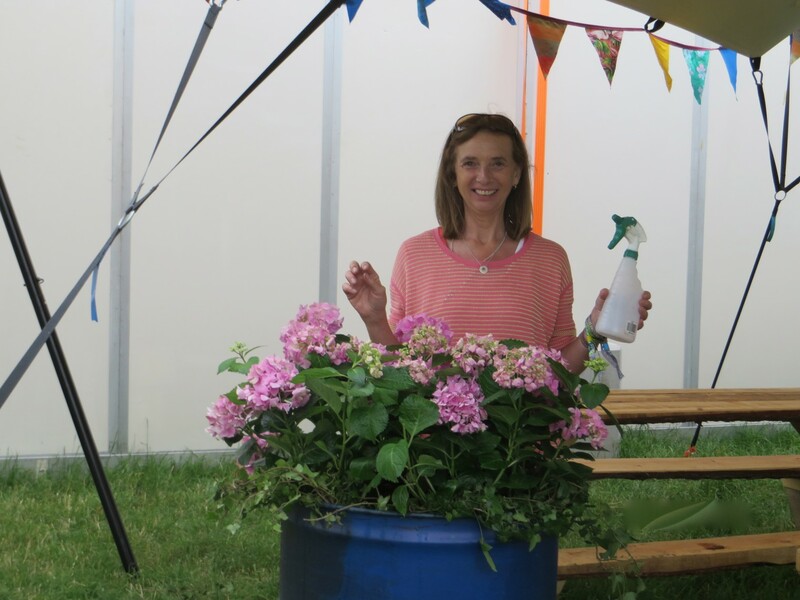 Making a woodland at the pyramid stage! Posted by Lorely on July 12, 2015. 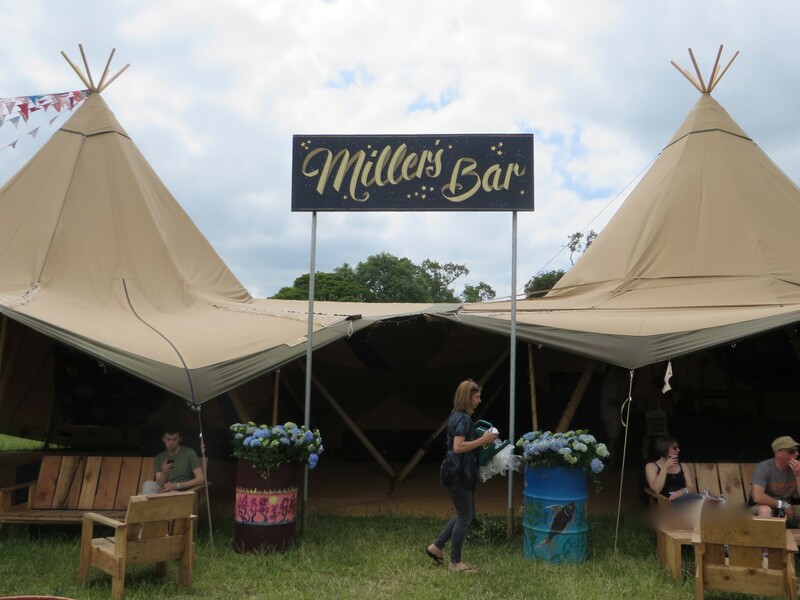 Summer parties, balls, weddings and festivals are keeping us busy and it was fantastic to again be involved with Glastonbury festival. 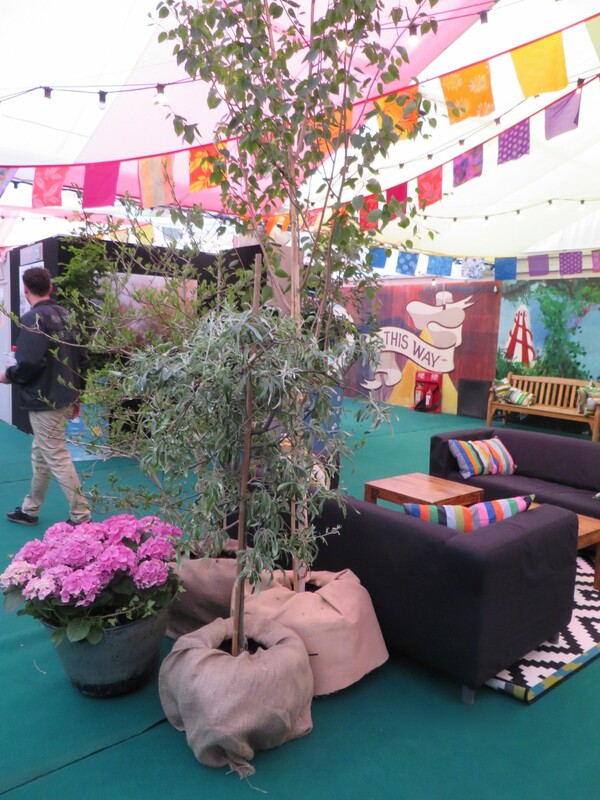 This years brief for back stage of the pyramid stage was to fill the area with trees! 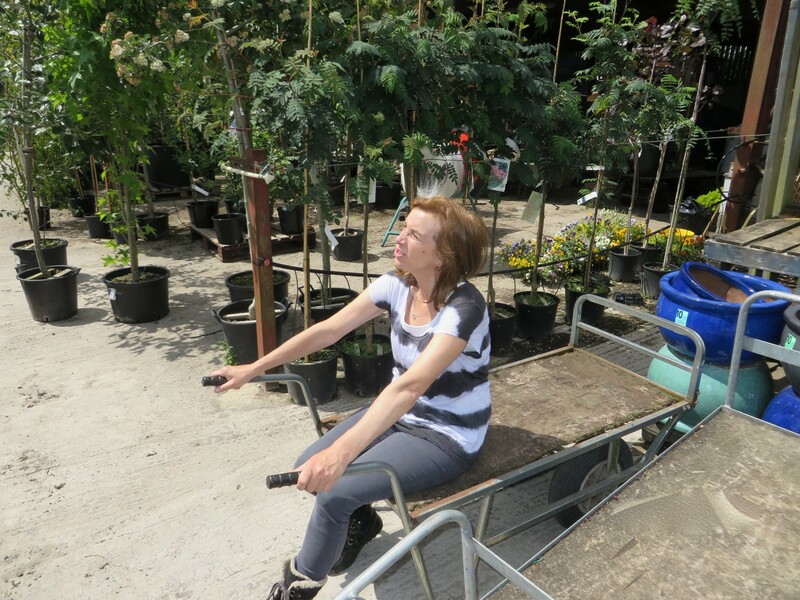 So armed with 94 trees varying in heights and variety we were on our way! 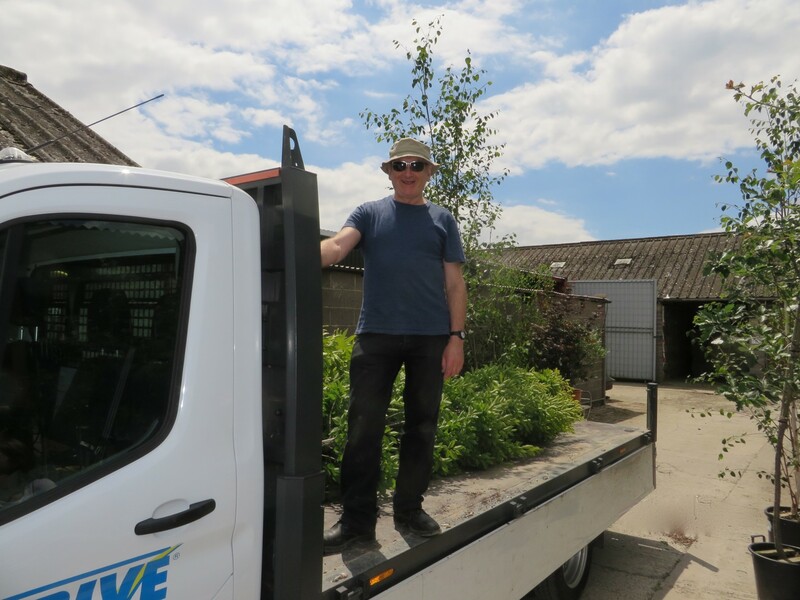 Loading the trees with our fantastic props man John Boy! Viv weighing out the logistics of the task ahead! 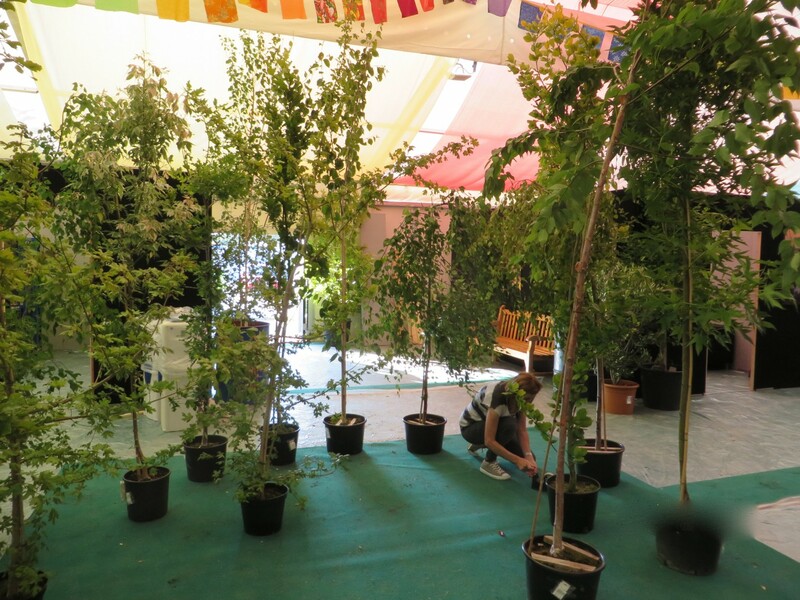 Backstage filled with maples, birches, beech and plane trees ready to be put into place. 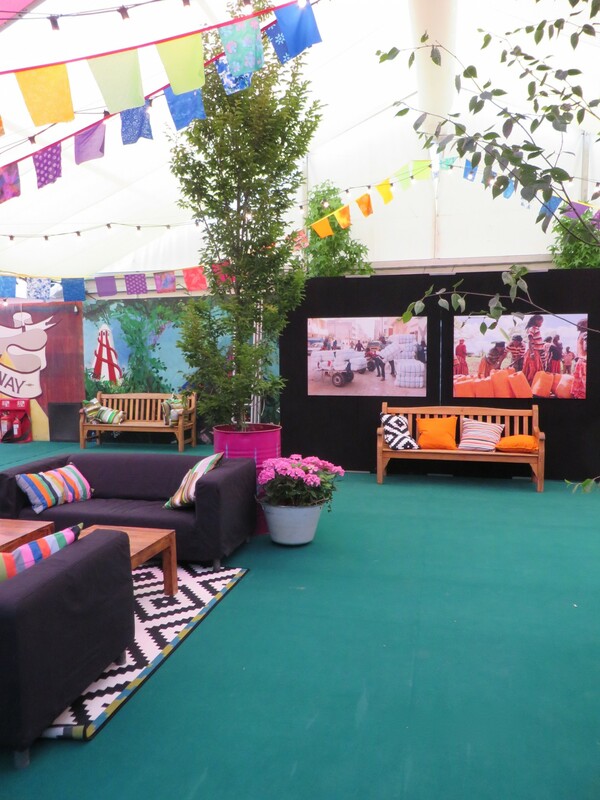 Metal bowls of hydrangeas added a splash of pink to go with the bright festival colours. Grouping the trees gave an strong impact, and brought a very fresh natural feeling into the whole space. In a mixture of painted oil drums and against the jet black wall the green foliage had a lovely vibrancy. 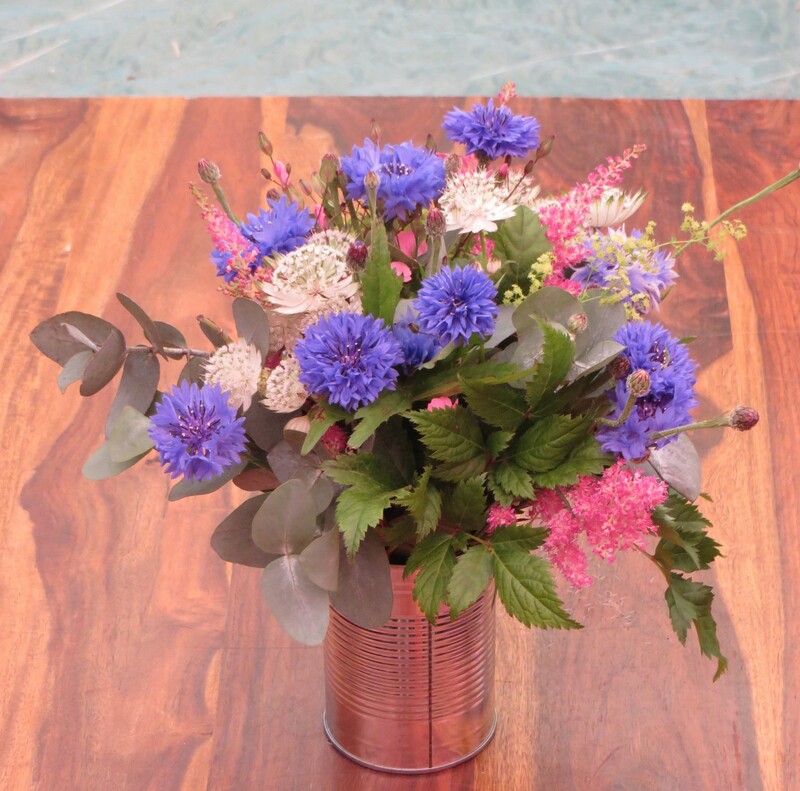 We made posies of country flowers in up cycled tin cans, locally grown cornflowers, summery astrantia, astillbe and eucalyptus, and dotted them on the coffee tables throughout the dressing rooms. 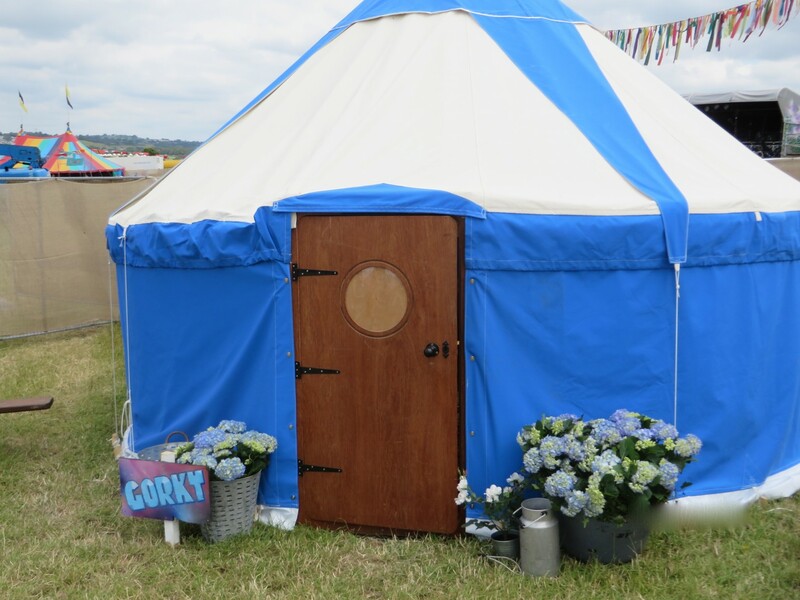 Yurts in the hospitality up at the Park, decorated with pots of hydrangeas. 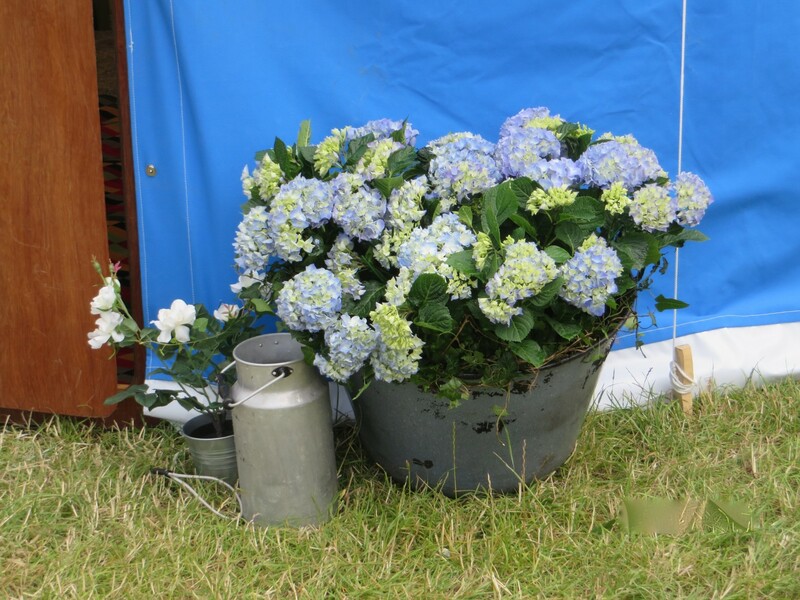 Roses, hydrangeas and milk churns at the Park. Painted oil drums filled with hydrangeas. 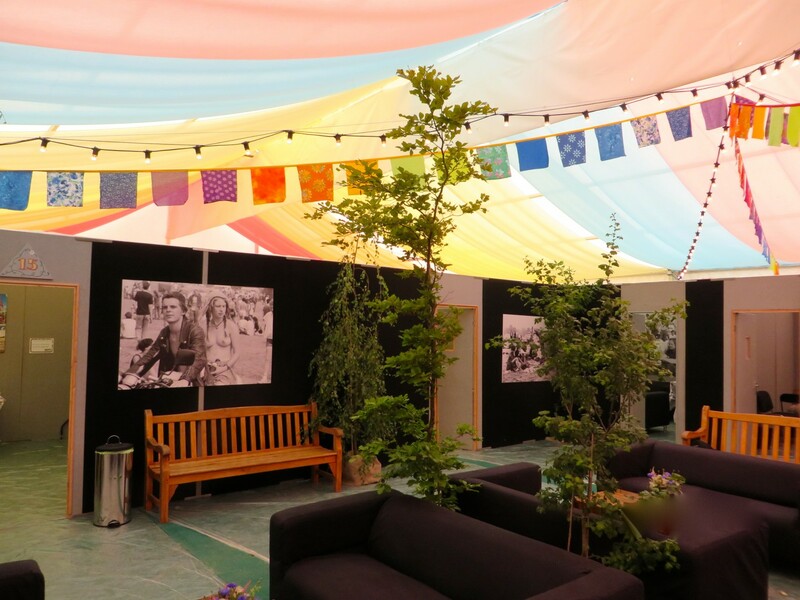 A hot weekend, and especially under lights in the marquees the plants and trees needed a daily water to keep them looking fresh. 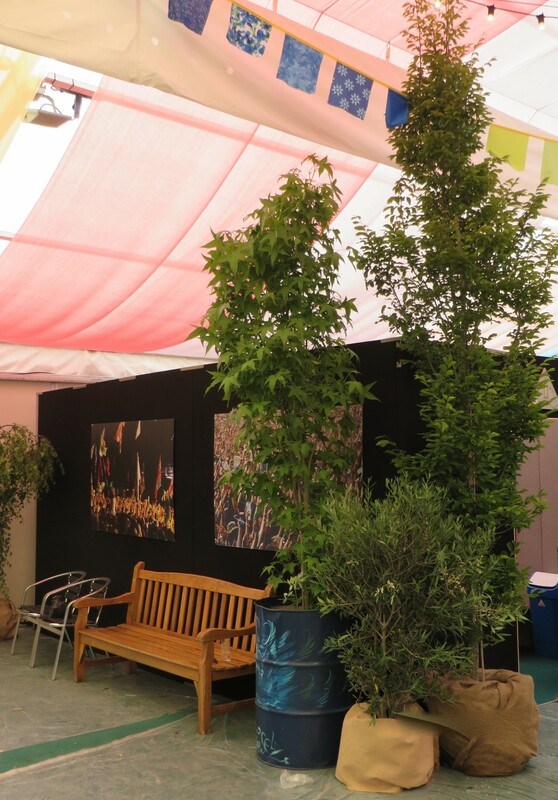 A forest backstage! Tin baths and hessian sacks made effective containers. Still smiling! A lot of hard work but always a pleasure to be involved in such a fantastic event.